CP ALL Plc. and its Subsidiaries (“Company”) are committed in operating our business in a manner that will resonate sustainability. This shall be achieved through implementation of a management system, which uphold good governance principles rooted in ethics, equality, traceability, accountability, and responsibility to all stakeholders. The Company complies to relevant laws and regulatory requirements, while simultaneously conforming our practices with international standards. This is in accordance to our goal to create values to society, to address and mitigate environmental impacts, as well as adapting to changing contexts. 2020 Goal : Disclosure of CP ALL Plc. and its Subsidiaries’ (“the Company”) good governance performance. 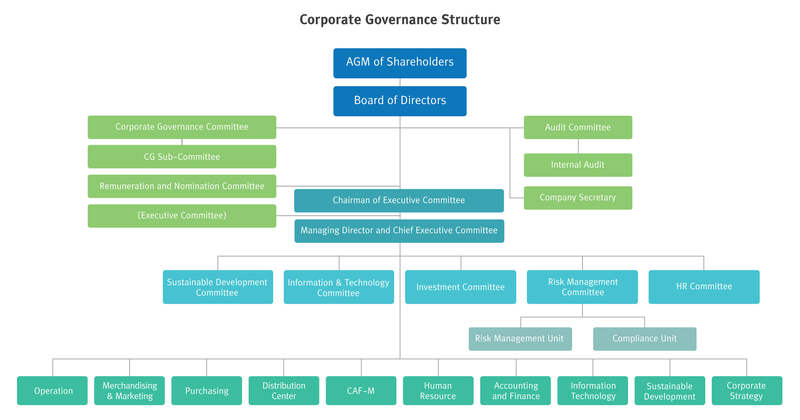 The Company’s corporate governance policy and code of conduct encompass 5 key areas: shareholders’ rights, equal treatment of shareholders, stakeholders’ role, information disclosure and transparency, and committee responsibilities. The Company has reviewed and revised our policy and guidelines to be in line with current situations, in additional to compliance to applicable laws and international standards. This was accomplished via implementation of Corporate Governance Code (CG Code), issued by the Securities and Exchange Commission (SEC), in the Company’s business contexts. The Company has created a Business Ethics Handbook and Code of Conduct. The documents are to be used as guidelines for the Board, management team, and Company employees. They support them in maintaining an ethical performance in their roles. The guidelines adheres to laws, transparency, to the Company’s commitment to fairness and ethics, customer-centric approach, social responsibility, political neutrality, equal treatment of all stakeholders; this is in additional to non-involvement in human right violations, anti-corruption, non-acceptance of compensation beyond common practice, anti-bribery, no conflicts of interests, and preclusion of activities involving Intellectual Property (IP) violations. The Company’s Board plays an important role in driving the organization, entrusted with the responsibility to ensure our corporate governance approach facilitates the Company towards the objectives and the goals of creating the highest value. Good corporate governance is built on the foundation of social and environmental responsibility, equal treatments to stakeholders—guided by the Corporate Governance and Anti-Corruption Policies. The Company’s corporate governance approach, defacto, complies with relevant legal requirements, corporate goals and regulations, the Board’s charters, guidelines, and resolutions, as well as Shareholders’ resolutions. Reflecting in nomination process, CP ALL respects and supports diversity of nomination person in term of gender, background, nationality, race, trust, and religion. Non-Executive Directors : The directors who do not hold a position in the management, may or may not be an independent director, and are not involved in the day-to-day operations of the organization. The Board of Directors’ Meeting is held once every quarter on a normal basis. The dates of the Board of Directors’ Meetings are predetermined one year in advance so that directors can arrange their schedule to attend the meeting. However, additional meetings may be called if there are special matters that require the Board’s approval. In 2017, a total of 6 Board of Directors’ Meetings were held which was appropriate for the duties and responsibilities of the Board and the operations of the Company in the previous year. In addition, there is one Non-Executive Directors Meeting in 2017. The meeting’s invitation, agenda and relevant documents were sent to the directors at least 7 days prior to the meeting date to allow sufficient time for the directors to study the information before decision-making. In the consideration of any issue, the directors are entitled to look at or check the related documents and ask the management to provide additional information. In every meeting, the management had been asked on questions raised by directors. The directors exercised careful, independent and transparent judgment with fair consideration for the interests of shareholders and stakeholders. Directors with vested interests in the matter under consideration must leave the meeting during consideration of that matter. The Chairman also provided sufficient time for directors to discuss problems and possible solutions. Management related to the presented agenda item were invited to the meeting to provide additional details and answer questions, which also is a good opportunity for the management to get to know the high-level executives for further job-handover. After the Board of Directors’ Meetings, the minutes were prepared, approved by the Board and filed at the Company Secretary Office for future reference and verification by directors and related persons. In the consideration of any issue, the directors are entitled to look at or check the related documents : ask the management to provide additional information and bring in outside consultants or experts to provide, at the Company’s expense. 1. Audit Committee In addition to financial auditing, the Committee also verifies the Company’s compliance to policies, rules and regulations, legal requirements, and requirements of regulatory authorities. Additionally, the Committee also assesses and ensures that there is a robust internal control and risk management process. Consultation with independent, third-party financial auditors have also been conducted to surface insights and recommendations on the Company’s financial statements and internal controls. Findings and recommendations, both from the Committee and external auditors, are reported to the Company Board every quarter. The Company has implemented these recommendations, and will be reporting intervention results in the following Board meeting. 2. Corporate Governance Committee The committee is responsible for drafting the corporate governance policy, anti-corruption policy, relevant code of conduct, business ethics code, and good work practice. The aforementioned policies and codes of conductare regularly revised annually, in order to ensure relevance with international standard, governmental and relevant organization’s regulations. The committee also actively produce recommendations, ubmitted as reports, to the board of director. The said submission will address their relevant areas, comprises: corporate governance, anti-corruption policy, and relevant code of conduct twice a year. Furthermore, the Committee monitors the compliance of the board, the directors, and employees. 3. 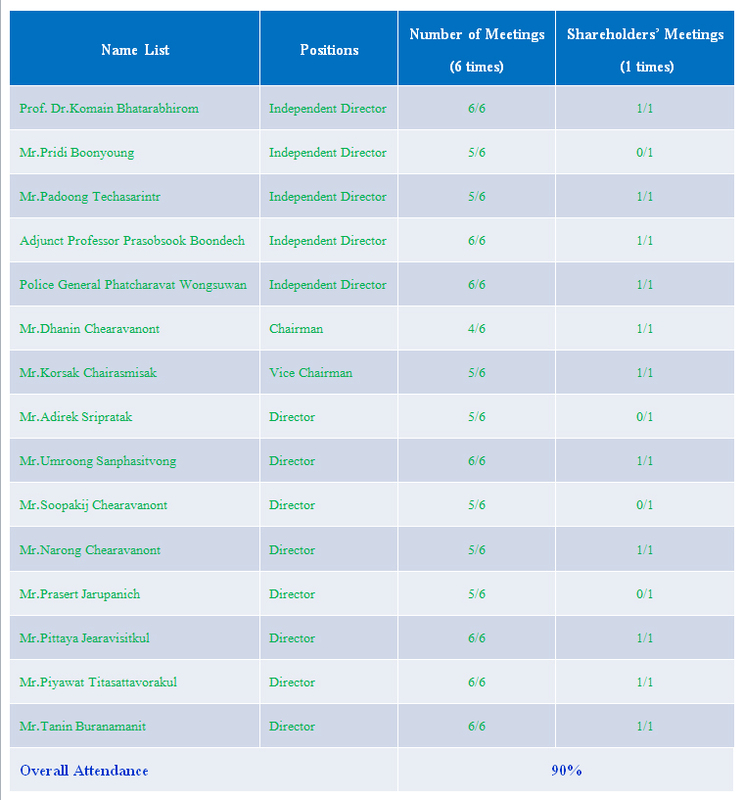 Remuneration and Nomination Committee The committee is responsible for establishing the criteria and compensation form for the board and executive, which will subsequently be presented to the board of directors. The board of director holds the authority to approve the compensation for the executive, while resolution from a shareholders’ meeting hold the authority to approve the board’s compensation. This committee also appraises the executive’s compensation to commensurate their performance. This is in addition to establishing criteria and hiring processes, in order to ascertain quality positioning of members. The committee selects the suitable individual basing from the aforementioned criteria and process, supplements with the shareholder’s nominee. This is in accordance to the Company’s regulations. Shareholders’ opinions are also noted in the board’s meeting prior to further propose to the shareholder’s meeting. The Company arranges for performance evaluation of the overall Board of Directors, and individually, in order to assist the Subcommittee in reviewing their past performance, obstacle and challenges of the year prior. This aims to improve all relevant performance, by enabling a clearer assessment of how their scope of duty and responsibilities are fulfilled. Simultaneously, the performance evaluation also offers an opportunity for the Board of Directors and management to improve relations. In 2017, results from the self-evaluation of Board of Director overall, individually, Audit Committee, Corporate Governance Committee, as well as Compensation and Appointment Committee are all in a good score range; having overall index score of 88, 86, 100, 95, and 93 respectively. For evaluation and consider extra remuneration payment to executive board, Board meeting resolution of the Remuneration and Nomination Committee. According to good corporate governance guidelines (CG guidelines) for board of directors no. 4.2, it indicates that the board shall ensure that an appropriate compensation structure is in place and can incentivize key executives to act in support of the company’s objectives and goals, and fosters long -term sustainable value creation. The board must also ensure that there is an appropriate performance evaluation. The board should delegate the RNC to consider the compensation criteria and structure for key executives and to present recommendations to the board for approval. The RNC considers and determines the criteria and methods for the fair remuneration; assesses key executives performance evaluation with hiring an external independent advisor for information and recommendations attached with the RNC consideration. The compensation shall be considered and updated for appropriation compared with the same industry and incentivize to key executives. 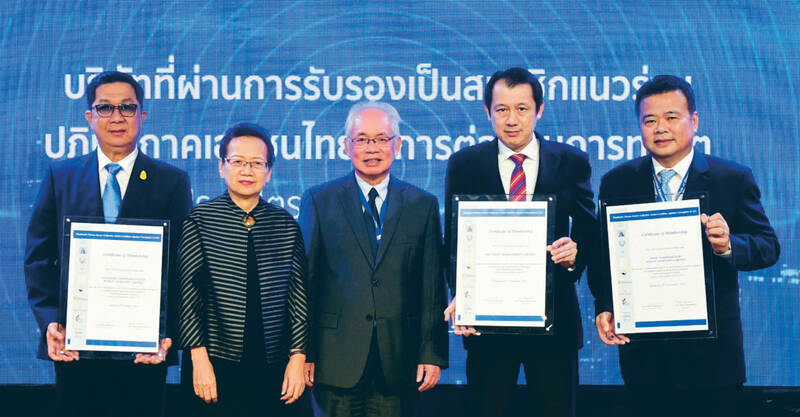 With the board authority, the RNC sets monthly fixed remuneration to key executives with a comparison of leading companies in Thailand and leading retail companies in Asia including approves additional short-term remunerations as bonus (Management incentive Plan – MIP). The additional bonus will vary upon achieved performance of set target with clear KPIs, Return on Equity (ROE), Customer Satisfaction and Sustainability Performance. Note: The company does not determined remuneration payment to key executives in the form of common shares or binding with long-term company’s performance and has no rules for key executives to hold common shares of the company. By the way, the company provides Employee Joint Investment Program – EJIP to encourage employees for ownership and incentivize loyalty and determination to grow with the company. EJIP will be based on voluntary basis and for only eligible employees. This program is the third time for the period of 5 years (July 2017-2022) following the first and second time (EJIP no.1 for the period of 3 years and EJIP no.2 for the period of 5 years). Moreover, the company has realized importance of all executives and staff’s collaboration to achieve the mentioned goal. So, the company considers to set a corporate KPI and the balanced goal of accounting, customers and social focusing, internal process development for excellence and organization learning such as sustainability performance, customer engagement. These KPI’s results will be reviewed every single quarter and year which will be also related to consideration on bonus increasing payment for executives and all staff. The Company sets a specific work sector within the organization structure to address this particular topic, ‘the Risk Management unit and Compliance unit’. They work under Risk Management Committee, while they are, themselves, comprised of representatives from all work sectors within the organization to ensure work effectiveness. The unit reports their actions and performance to the Audit Committee, in compliance with the Audit Committee’s charter on effective auditing process and risk management process. The management processes are for a multitude of risks, such as strategic risk, operational risk, financial risk, compliance risk, social, environment, and economic risk, tax risk, and risk of corruption. In 2017, the company communicates with the aim to create awareness on business ethics, anti-corruption policy, and code of conduct, to all levels in the organization, as well as the subsidiaries’ employees, for a total of 142,784 individuals. The company also organizes trainings and workshops to strengthen employees’ understanding, as many as 3,161 individuals participated. Details are as follows. In addition, to ensure that all employees understand and are capable of adhering with the compliance, the Company arranges an examination for those in division (Department) manager level and above. They must pass with 100% score. To ensure the approach is effective in all work sectors, the Company applies various standards to develop Corporate Governance Self-Assessment tool. This assessment will be used from 2017 onward. This tool references international standard of corporate governance, good assessment conducts, and good corporate governance conducts, such as Transparency International, Organization for Economic Co-operation and Development Principles of Corporate Governance, and more. Self-evaluation forms were sent to 100% of divisional managers, company’s business units, and subsidiaries. Response rate was at 98%. The overall score from self-evaluation is 97%. Details are illustrated in the table below.